A promise ring meaning can be many different things, and before giving this tangible symbol of a commitment individuals should be certain their promise will be easily understood not only by the person wearing the ring, but by others who may misconstrue the intent of the promise. Promise rings are small, beautiful pieces of jewelry that are often given between friends or couples to represent a commitment. The most common promise represented by a ring is a precursor to an engagement when a promise ring is exchanged instead of a true engagement ring because the couple may not be the right age to get engaged or they may have financial or other difficulties to overcome before they choose to become fully engaged and set a wedding date. There are many other meanings that can be attributed to promise rings, however, and they can be exchanged between many types of people, including parents and children, best friends, or between an already married couple. Friendship: Best friends may exchange complementary or identical rings to symbolize their enduring relationship, particularly if they are moving away from one another and will not be together frequently. The ring can serve as a reminder of their friendship and their commitment to keep in touch. Purity: A promise ring may be used as a tangible symbol of purity, either from a pledge to remain sexually abstinent until marriage or a promise to remain pure from undesirable influences, such as drinking, smoking, or drugs. Religion: Religious promise rings can represent a commitment to a specific faith or a more specialized part of that faith, such as following a particular saint or performing a consecrated role in the church. Monogamy: A promise of fidelity may be represented by a beautiful ring, whether it is exchanged between a young couple or a married couple who may have experienced an adulterous intrusion into their relationship. Gay couples may also use promise rings to pledge their monogamous commitment to one another in lieu of an engagement ring or wedding ring if they cannot legally marry. In fact, there is no promise that cannot be represented by a carefully chosen, thoughtfully given ring. As long as both the giver and the recipient are fully aware of what the ring represents, the unending circle of that ring can symbolize the unending commitment to that promise. 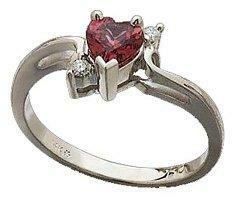 Birthstones make beautiful promise rings. How a promise ring is designed can add even more layers to its meaning. 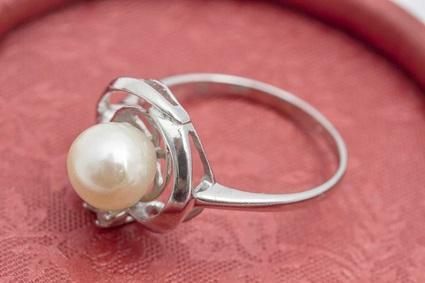 Birthstones can be used to connect two individuals in the ring's design, or a heart shaped stone may be used to represent love, friendship, or romance. Doves, crosses, and angels are frequently used as symbols for religious promise rings, while other figural designs can be coordinated with related promises. Even plain promise rings or bands can be engraved to add more emphasis to the promise: the date of the promise, a few words of encouragement, or an intimate sentiment can make any promise ring even more meaningful. Despite the most well intentioned promise ring meaning, it may spark controversies. A diamond promise ring may be misconstrued as an official engagement ring either by the ring's recipient or by family members and friends who jump to conclusions about the meaning of the ring. A plain band could also be misinterpreted as a wedding band, particularly if it is worn on the ring finger of the left hand. To help avoid these types of misinterpretations, individuals can choose promise ring designs that are less likely to be confused with other rings. How the ring is worn can also help alleviate misconceptions - wearing the ring on the right hand, for example, can reassure others about its true meaning as a promise rather than another type of ring. Another highly opinionated controversy about promise rings is whether or not a marital promise ring - the precursor to an engagement ring - really represents a commitment, or just the lack of one. This is particularly true if the couple is older and able to get married - family members and friends may question why a promise ring is given when an engagement ring may seem more appropriate. Couples who do exchange promise rings in this way should be prepared to patiently explain their promise and what it means to their relationship without alienating others or taking offense at unintentional misinterpretations. A promise ring meaning can be many things, from a simple declaration of friendship to a solemn vow of chastity to the first step toward a wedding ring. Whatever the ring may mean, however, exchanging it is a symbol of a commitment between two people who share a special relationship, and the strength of that promise will uphold the strength of their relationship.